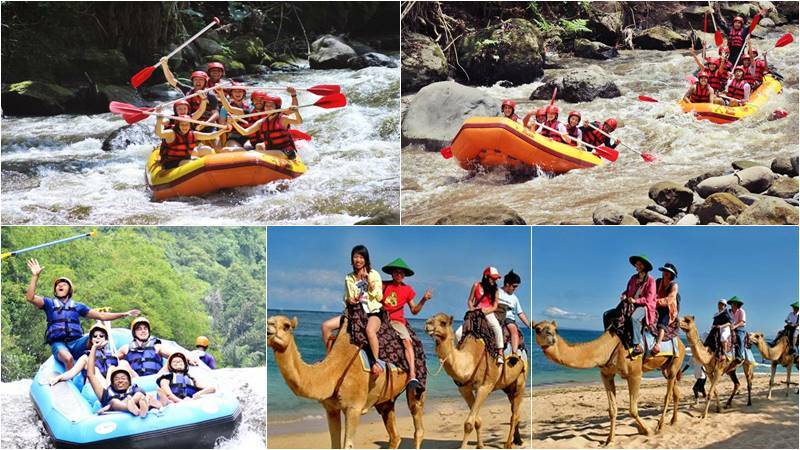 Bali Rafting + Camel ride tour is an amazing Bali Rafting Tour package where you will enjoy the Camel Ride at Nusa Dua area with 1 Hour Ride then combining with white water rafting either at Ayung River, Telaga Waja river or Melangit River, this adventure can be enjoy in one day, book your trip by online booking or last minute booking by direct call. This Adventure is really most famous choice for our customer. 16.00 – Transfer back to Hotel. Bali Camel Safari Tour guide take the lead rope and prodded the camels into motion. The camel’s moved in a casual saunter that triggered a comfortable swaying for the riders up top. you can ride a camel in the side part of the beach with its white sands of Nusa Dua and the nature around it with some of temples there. The Camel have already trained to adapt to people and the environment. And also we choose some of the professional tamers to guide you. All of the animals that we use are become accustomed to serve the guest from the different age. Don’t worry because our animals do not disturb you. To keep Bali Camel Safari quality, we always give the priority for the safety and the pleasure of the guest. Continue your adventure in Bali by experience 2 hours of white water rafting on the Ayung River along the Paradise River with gorgeous jungle, bamboo trees, cliff carving and waterfall. Or try the most challenging Telaga Waja white water rafting with its crystal water, beautiful scenery and jump 4 meters high from the water slide of Bajing Dam. Last option for your rafting is Melangit river, which has over thirty rapids with 1 to 4 meters in height. The turning river is sharp, current is fast and the impact of the river walls is challenging and makes the adventure with an 8 km journey more exciting.